Sometime ago—the spring of 2013, I think—I read a recommendation that every writer should include on his/her website a tab for the media. Unfortunately, I no longer remember the source, but in any case, the idea was to put in one place, clearly labeled as “Media” or “Press,” the information that reporters might need: author bio and picture, book descriptions, reviews—in short, a press kit. The advice suggested putting the information in both readable format on the web page and in PDF format for download. Even though my books, published by a small press, had made so little splash in the media that preparing a press kit seemed like hubris, I figured a media page with information on me and my books couldn’t hurt. Alas, I had never seen a press kit. I put together the information in a single document that ran about 15 pages. Luckily for me, no one downloaded it. But on the off-chance that some of my readers may never have seen a press kit either, I thought this post might prove useful. Even traditionally published authors are asked to provide information for their own press kits, although they can expect to receive more guidance than I did. My woeful ignorance changed when I became the host of New Books in Historical Fiction. Publicists began sending me press kits together with review copies of the books whose authors I planned to interview. After a while, it dawned on me that I could use these as models to spiff up my own miserable efforts, a task now mostly complete. So what did I learn? What is a press kit? 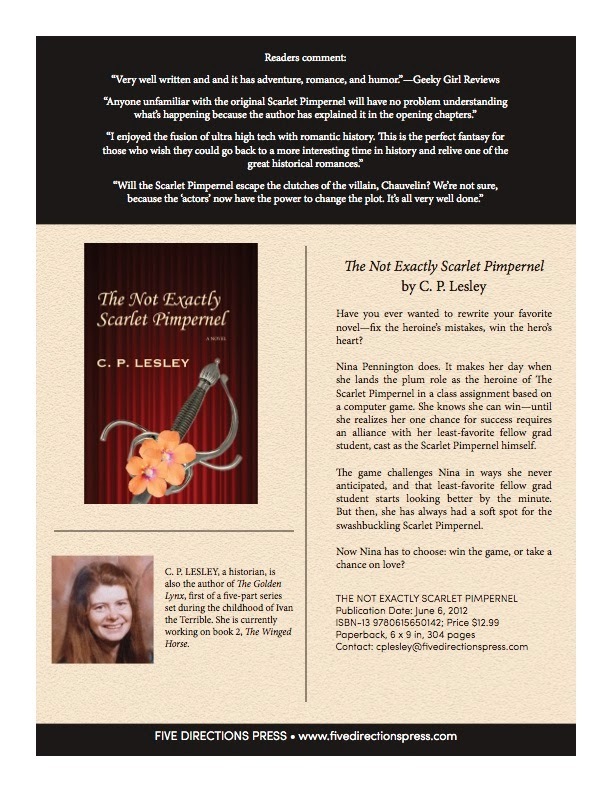 I’ll use the one I created for The Not Exactly Scarlet Pimpernel as an example (but keep in mind that others may—and probably do—have a better grasp of the form than I do). First off, a press kit is a single page, printed on both sides, or at most three pieces of paper. It focuses on one book. Typically, it starts off with quotations from reviews—the more prestigious the issuing publication, the better. In my case, because my publisher is so small, I used one- or two-sentence excerpts from reader reviews, chosen to give the widest sense of the story’s tone and impact. The next most important element is the book cover and information. I chose to run these side by side, in a template that I am developing for all the Five Directions Press books. The book information includes the title and author’s name, the blurb from the back, the publication date, ISBN, price, format, number of pages, and contact information for me and for the press. Then we have information about the author, including a picture, which often appears on the back of page 1. Since I am a relatively unknown author, I kept this short and put it on the front, then used the other side to give some background information on why I wrote this book. For The Golden Lynx, I used the same format but provided historical information on the entire series. And that’s it. If your book has won awards, add them to the first page and move the author’s information to the reverse side. If you have many books reviewed in important places, you can add a second page to cover the gamut of your literary fame. If your book relies on specialized knowledge—understanding agoraphobia, the cultural climate of eighth-century Central Asia, what led to Zelda Fitzgerald’s confinement to an insane asylum—you may want to add a second or third page to convey the basics, so that a reporter need not look them up. But keep it short. And the fewer credentials you have, the more modest the press kit needs to be. Only comedians want to leave journalists laughing hysterically at their claims. As always, it pays to edit, edit, edit and to find someone who can put a bit of thought into the design—and who owns the software that makes that design look professional. But the good news is that the press kit is much easier to produce than I originally thought. You probably have all the information in various marketing materials. 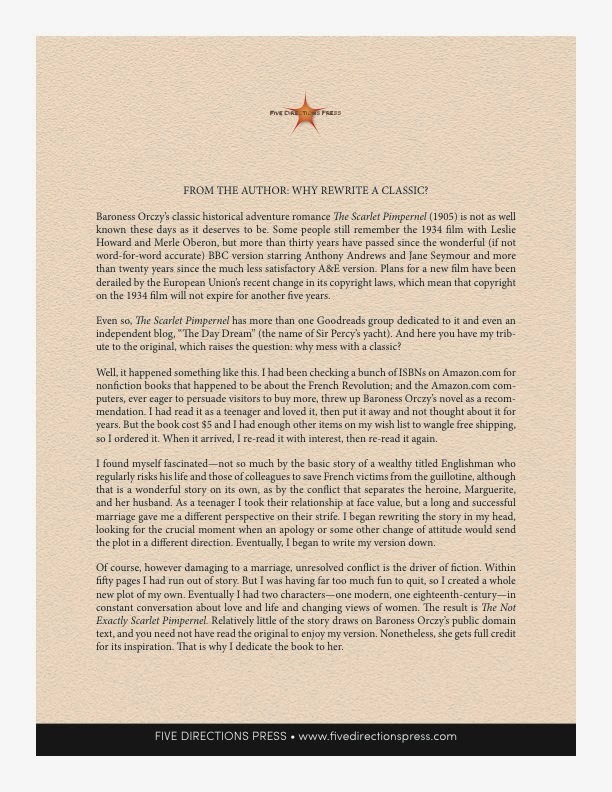 My discussions on the back came from the mini-essays I wrote to fill in the review space for my books on GoodReads. So go for it. It’s not difficult. And if the press does knock on your door. You’ll be ready. If you’d like to see more, you can find the press kits on my website. This is very useful info. I shall bookmark it & Tweet it! Very interesting post! I have not given this any thought before but, as you suggest, it pays to be prepared!